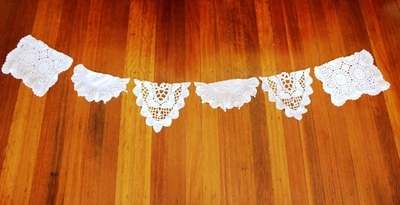 For something a little bit different, why not decorate your next party with some delicate lace bunting? 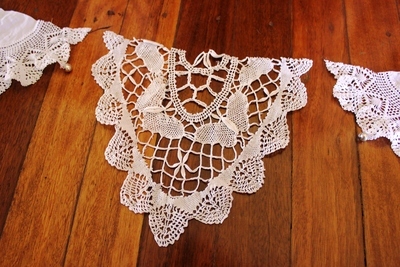 Vintage doilies are just the right shape to turn into elegant bunting and they are easy (and cheap) to find in your local Op Shop. 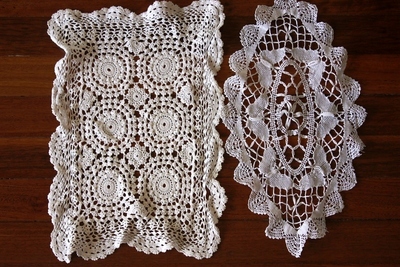 Once you've found some lace doilies (try the local Op Shop) which you don't mind recycling, carefully cut each one in half. Lay your doilies out all in a line to measure how much ribbon you require. Try to make them symmetrical for a more balanced looking bunting. Sew each doily onto the ribbon by hand or with a sewing machine, then hang them up to add a touch of old world charm to your next dress up party or gathering. I think these buntings would be just perfect for a high tea or some similar elegant styled occasion. 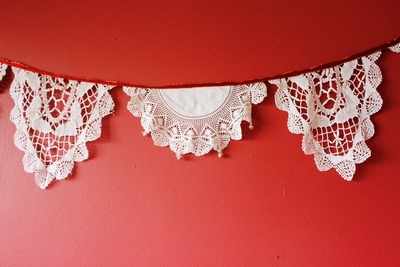 Lace Bunting - What a great idea. I am over buying streamers and who notices. I would use this for any female party that's small and intimate. Thanks so much! The bunting is so pretty.